Cover of Shards of Honor, the first book in the series. The point of view characters include women (Cordelia in Shards of Honor and Barrayar; Ekaterin in Komarr, A Civil Campaign, and The Flowers of Vashnoi), a gay man (Ethan of Athos), and a pair of brothers, one of whom is physically handicapped and the other a clone (Miles and Mark Vorkosigan), their cousin (Ivan Vorpatril) together with some minor characters (e.g., Miles' bodyguard Roic and the runaway lad Jin). The various forms of society and government Bujold presents often reflect contemporary politics. In many novels, there is a contrast between the technology-rich egalitarian Beta Colony and the heroic, militaristic, hierarchical society of Barrayar, where personal relationships must ensure societal continuity. Miles Vorkosigan, the protagonist of most of the series, is the son of a Betan mother and a Barrayaran aristocrat, embodying this contrast. Humanity has colonized a galaxy in which there are no competing intelligent species. Since then (at least 400 years before Falling Free or 600 years before Shards of Honor), dozens of planets were colonized and have developed divergent cultures. Within the series, exploration and colonization of new planets is still ongoing, most notably on the planet Sergyar. Interstellar travel is achieved by "jumping" from solar system to solar system via spatial anomalies known as wormholes that create tunnels in a five-dimensional space. Typically wormholes are bracketed by space stations, military or commercial, which provide ports for jump travel. Stations may be owned by planetary governments, or by specific commercial organizations, or they may be completely independent of any planetary organization. The stories feature several planetary systems, each with its own political organization, including government by corporate democracy, rule by criminal corporations, monarchies, empires and direct democracies. In most cases, there is a single government which dominates the entire planet (an exception is Jackson's Whole). Both Cetaganda and Barrayar have empires, acquired by conquering other planets via neighboring wormholes. As a tool to simplify the writing process, Bujold devises a standard system of timekeeping universal to all planets regardless of the length of their day and year. Bujold herself has commented that her posited system is neither technologically nor economically feasible, but is rather a convenience for storytelling. Most of the technology in the series is based on 20th-century engineering situations, projected into null-g or alternative solar system situations. Biomedical advances such as cloning, artificial wombs (named "uterine replicators") and cryochambers to preserve and revive recently deceased people are featured heavily in the series. Bujold presents issues of technological obsolescence and the high rate of failure of R&D projects in personal terms, via bioengineering. Two jump pilots with obsolete navigational brain implants and a number of characters created by genetic manipulation are psychologically stranded by the termination of the program for which they were designed. The series features gravity manipulation, both artificially generated in spaceships, or artificially suppressed in ground transport and elevators. Falling Free and Diplomatic Immunity explore the relationship between a culture adapted to an environment without gravity and one which depends on gravity. In most societies featured in the series, paper has been mostly replaced by either plastic sheets or electronic devices, and two-dimensional video is replaced by three-dimensional holograms. Most characters use portable computers called "wristconsoles" and personal computers named "comconsoles". Interstellar messages, however, have to be recorded on a physical disc which is transported through wormholes at a high cost, and relayed between wormholes by the ships' communication systems, imposing both time and cost constraints to interstellar communications. As the series features a military background in several novels, special attention is paid to military technology. Ship to ship combat includes plasma rays and attacks based on gravity manipulation and defensive countermeasures. Personal combat includes the use of combat suits, plasma rays and nerve disruptors, which are rays that destroy nerve tissue. Biological weapons are also mentioned in the form of wide spectrum toxin bombs and genetically modified microbes that target specific races, and in some cases, specific people. A truth serum, "fast-penta", is a widespread tool used in interrogation. Several defenses are devised, like induced allergies that kill the subject before they can reveal information, genetic engineering to create immunity, or compartmentalization of information on a need-to-know basis. Miles Vorkosigan has an atypical reaction to the drug which enables him to thwart his enemies on at least one occasion. In the Vorkosigan saga, humans live on planets with diverse degrees of habitability, and have developed diverse adaptation strategies to environments that are only approximately fit for human life. Most inhabited planets have gone through long-term terraforming to make them habitable. In spaceships and space stations, people live in closed ecologies in which air and waste are continuously reprocessed. Medical advances are a fundamental part of the saga's worldbuilding. The most notorious are "uterine replicators", devices who allow complete in vitro reproduction, with gene therapy to correct for congenital defects. It also makes possible an all-male society in which eggs are produced by ovaries maintained in a lab. Other advances include genetic manipulation to produce microbes and animals tailored for specific purposes, or humans adapted for combat or to live and work in zero gravity. Fertile hermaphrodites have been created in an attempt to surpass gender roles. Medical prolonging of human life has advanced to achieve natural lifespans of 120 years on certain planets. Cloning is featured in the series, prominently in the person of Mark, Miles' clone-brother, and in an industry that grows clones of wealthy people to transplant their brains from elderly bodies to youthful, healthy ones. Barrayar is an exception to most of these advances due to its long isolation from the rest of humanity. Women carrying their babies to term without uterine replicators is the rule at the beginning of the series, and there is an ingrained fear of mutation in its society. The social challenges posed by medical technology are mentioned in the plot of several of the stories. The Wormhole Nexus allows Bujold, paradoxically, to imagine a world in which travel and communication require far more time and effort than in the real-life 21st century, since the wormhole jumps present a special barrier. Each planet is a kind of petri dish in which a particular human culture—derived to some extent from a culture known historically on Earth—lives and changes. The worlds of Barrayar and Athos, for example, suggest aspects of preindustrial Europe and America. Cultures range from the monogamous (but not celibate) utopia of Athos to the genetically enhanced and highly aggressive inhabitants of the Cetagandan Empire; from the cut-throat capitalists of Jackson's Whole to moderate and scientific Escobar. The quaddies, people genetically engineered to be the perfect zero gravity workers by replacing their feet with additional hands, practice a communalism in which the work gang is the basic unit of governance. Although Bujold explores and satirizes many kinds of societies and prejudices, her universe isn't infinite and doesn't explore every possible idea. She doesn't focus much on several sources of social organization and prejudice on Earth, for instance: language, skin color, and religion. Except for two scenes in all the novels, all Nexus inhabitants speak English, though they may know other languages or have a planetary accent. A good-looking woman, whether a four-armed quaddie, a Cetagandan haut-lady glimpsed in her floating bubble, or a Barrayaran damsel, has skin comparable to ivory or milk. On the other hand, the most prominent genotype on Barrayar is olive skin (and brown eyes and dark hair) and Tej, who has coffee-brown skin, is described by Ivan as very pretty. One important non-Caucasian character, the Asian Ky Tung, is from Earth. Others include the Durona group: Lilly, Lotus, Rowan, Raven and Lilly Junior, who are described as Eurasian. The entire Arqua family: Tej, Pidge, Erik, Stella, Amari and their father, are not caucasian, instead possessing a brown skin tone. Only isolated Athos has a planetary religion, though Cordelia Naismith and Leo Graf (the hero of Falling Free) believe in a God. Bujold builds prejudice into the "locale", i.e. planetary economics and history. The Barrayarans, with their single wormhole to defend and a broadly habitable planet, both need and can afford a militaristic society with a certain amount of internal competition as large families spread out into newly terraformed regions. They see discipline as emanating from the Emperor through the all-male militarized hierarchy. The Betans, on a hostile planet where they must live in domes, rely on industrial export; they limit not only childbearing but also every kind of behavior that might be considered "antisocial". From their point of view, Barrayaran society is irrational and backwards, while the Barrayarans view them as undisciplined in every way, referring to a "Betan vote" as an obstacle to decision-making. Planets accessible by many wormholes become centers of trade and finance, whether benign (Komarr, Escobar) or malicious (Jackson's Whole); any threat to the pocketbook is resented there. Finally, dwellers in space habitats look down on those who call one planet home as "dirt suckers". In all the books except Ethan of Athos and Falling Free, the protagonists are connected to the planet Barrayar, home of the Vorkosigan clan. Bujold devised for this planet a history which allowed for "swords 'n' spaceships". In the lifetime of Miles Vorkosigan, Barrayar uses spaceships, computers, and other high technology, but its culture remembers dueling, celebrates the Emperor's birthday by handing him bags of gold, and provides liveried life-sworn servants to carry love letters sealed with the writer's blood. In the conservative backwoods, some still practice infanticide if signs of mutation are detected. Barrayar is a planet colonized by humans some four hundred years prior to Shards of Honor, the first Vorkosigan novel. Shortly after colonization, the 50,000 settlers are cut off by a failure of the sole wormhole connecting Barrayar to the rest of humanity. During the following centuries, referred to as the "Time of Isolation", the colony regresses socially and technologically, eventually developing a feudal form of government, in which the Emperor of Barrayar is supported by sixty regional counts and other minor aristocrats, identified by the honorific prefix Vor- in their names. The Vor caste is a military one, and Barrayaran culture is highly militaristic and hierarchical. Barrayar is eventually rediscovered by a different wormhole route controlled by the rich merchant planet Komarr. The Komarrans allow the neighboring expansionist Cetagandan Empire to invade Barrayar in return for commercial rights and concessions. Despite a significant technological advantage, the Cetagandans are finally expelled at great cost after many years of occupation and guerrilla warfare, in large part due to the leadership of General Count Piotr Vorkosigan, Miles' paternal grandfather. The Barrayarans then conquer and annex Komarr under the command of Admiral Aral Vorkosigan, Count Piotr's second son. Aral Vorkosigan later meets Cordelia Naismith, an enemy officer from Beta Colony, at the commencement of another war. Forced to work together to survive on a hostile planet, they fell in love and eventually marry, resulting in the conception of Miles. However, an attempt is made to poison Aral during his regency for the child Emperor, Gregor Vorbarra, in which a pregnant Cordelia is exposed to a poison. The side effects of the antidote threaten to kill the fetus, and desperate experimental medical procedures are required to save the unborn baby. Though his frailties are gradually mended, Miles' physical development is severely affected, and as an adult, he is subtly but noticeably misshapen and no taller than an adolescent boy. As a result, he has to deal with the deeply ingrained prejudice against mutants on his native world (though he is not technically one). With nearly pathological determination and high intelligence, aided by his supportive parents and their high social rank, he fashions an extraordinary military and civilian career for himself in the Barrayaran Empire. The entire series won the Hugo Award for Best Series in 2017. Three of the novels made the New York Times Bestseller List when first released in hardback: A Civil Campaign at #26, Diplomatic Immunity at #25, and Cryoburn at #32. The novels have been translated into a number of languages and the covers of various international editions has been archived. A Warrior's Apprentice comic book was published in France in 2010, which was the first of a projected series called La Saga Vorkosigan. The roots of the Vorkosigan Saga lie in an early collection by Bujold called Dreamweaver's Dilemma. The title story features Beta Colony, and another story contains a character named Cordelia Naismith, perhaps a distant ancestor of the Vorkosigan character. 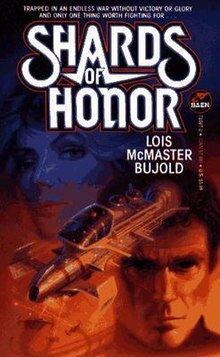 When beginning her first novel, Shards of Honor, Bujold incorporated these elements, but greatly expanded. She followed that up with the second novel with the same setting, The Warrior's Apprentice, then worked on Ethan of Athos. After being rejected by four publishers, The Warrior's Apprentice was accepted by Baen Books, who agreed to a three-book deal to include the two other novels. Shards of Honor and Barrayar concern Miles' parents, Ethan of Athos involves a few minor characters from other Vorkosigan novels, and Falling Free does not involve Miles or any of his family, though in a later novel Miles encounters the descendants of the characters from Falling Free . While all the books and novellas are currently in print as ebooks, in America they are in print as omnibus editions. The Saga's internal chronology does not match the order in which the books were written. Bujold has stated on her blog that she is generally in favor of reading the books in internal chronological order. A more detailed chronology can be found in The Vorkosigan Companion. "Dreamweaver's Dilemma" is a short story set at the beginning of Earth's age of space colonization and genetic manipulation. It was published in the book of the same name, which is a collection of short stories and essays by Bujold that had been previously unpublished and that she gathered together prior to her appearance at a NESFA convention. "Dreamweaver's Dilemma" contains the first mention of Beta Colony. It is also the only Vorkosigan Saga story not published or republished by Baen Books. 200 years before the birth of Miles Vorkosigan, engineer Leo Graf encounters the Quaddies, who are genetically engineered to have an extra pair of arms in place of legs in order to work better in free-falling environment of space. Collected in the omnibus edition Miles, Mutants and Microbes. Captain Cordelia Naismith of Beta Colony meets and eventually falls in love with Captain Lord Aral Vorkosigan of Barrayar when they are both stranded on an uninhabited planet. After being captured by the Barrayarans and then escaping twice, she returns home a war hero. However, her own people believe she has been brainwashed and try to "cure" her of her love for Aral. She eventually flees to Barrayar to be reunited with him. Collected in the omnibus edition Cordelia's Honor. Two people retrieve bodies in space near Escobar after the failed Barrayaran invasion. The story was originally a postscript to Shards of Honor and later included in the omnibus edition Cordelia's Honor. While Cordelia Vorkosigan is pregnant with Miles, an attempted assassination threatens her unborn child's life. Count Vordarian launches a coup. Collected in the omnibus edition Cordelia's Honor. Seventeen-year-old Miles breaks both legs running an obstacle course, seemingly ruining his chance of a military career. On a visit to Beta Colony, he obtains a ship, a pilot, and a contract to run guns to a blockaded government. He eventually takes over much of the blockading mercenary fleet through brilliant improvisation, sheer audacity and much luck. The unexpected arrival of his cousin Ivan Vorpatril raises Miles' suspicions. He hastens home to foil a plot against his father. Collected in the omnibus edition Young Miles. Miles has just graduated from the Imperial Academy, and is at home at Vorkosigan Surleau with his parents. A woman from an isolated rural village demands justice for the murder of her baby, who was born with a cleft lip and palate, but was otherwise healthy. Miles' father sends him to investigate as his Voice (representative with full powers) to gain experience. Miles solves the mystery and exercises justice and mercy in appropriate measures. Collected in the omnibus editions Young Miles and Borders of Infinity. Miles is shipped off-planet to the Hegen Hub after refusing to obey what he considers to be a criminal order at a training camp and being accused of treason (again). He finds himself having to rescue his friend and emperor, Gregor Vorbarra. Collected in the omnibus edition Young Miles. Miles and Ivan are sent to the home world of the Cetagandan Empire to represent Barrayar at an Imperial funeral, and quickly become entangled in a murderous Cetagandan plot. Collected in the omnibus edition Miles, Mystery, and Mayhem. This novel does not feature Miles except indirectly; his eventual girlfriend, Commander Elli Quinn of the Dendarii Free Mercenary Fleet, plays a leading role. Collected in the omnibus edition Miles, Mystery, and Mayhem. Miles travels to Jackson's Whole, ostensibly to buy weapons, but in reality to help geneticist Dr. Hugh Canaba leave his current employer to go to work for Barrayar. Canaba throws a wrench into the works when he refuses to leave without certain experimental samples which he has injected into one of his earlier projects, a prototype "super-soldier". Even worse, the "super-soldier" has been sold to the paranoid and sadistic Baron Ryoval, whom Miles has recently offended. Miles breaks into Ryoval's laboratory, but is caught and imprisoned in a utility sublevel where they are also keeping Canaba's dangerous specimen, "Nine". This turns out to be an eight-foot-tall warrior, complete with fangs, claws, superhuman strength and speed, and a ravenous appetite. Miles is shocked to find that the creature is female, and, despite her fearsome appearance, intelligent and emotionally vulnerable. She challenges him to prove that he believes she is human by making love to her. Miles gets to indulge his weakness for tall strong women... He offers her a new life with the Dendarii, and a new name: Taura. They escape, committing one supreme act of sabotage and revenge before Dendarii Captain Bel Thorne manages to negotiate a ransom. Miles finds several aspects of the deal unacceptable and the exchange turns into a minor battle with Ryoval's security. In the course of their hasty departure from the Jackson system, Miles sows confusion by telling different lies (and a couple of vital truths) to Ryoval and his rival half-brother, weapons dealer Baron Fell. Collected in the omnibus editions Miles, Mystery, and Mayhem; Miles, Mutants and Microbes; and Borders of Infinity. Miles goes undercover and allows himself to be captured by the Cetagandans, who have invaded and occupied the planet Marilac, in order to infiltrate a maximum-security POW camp on Dagoola IV. His mission is to get the Marilacan commander out, but he has to improvise when he finds the man catatonic and on the verge of death. With a little help from Suegar, an apparent religious fanatic, and Tris, the leader of the female prisoners, he instills order and hope in the apathetic, distrustful inmates, makes them rehearse for quick embarkation (disguised as a food distribution procedure), and stages one of the largest mass breakouts in history. As a result, the Cetagandans put a price on Naismith's head. At this point, they (along with nearly everyone else) are unaware that Naismith and Miles Vorkosigan are one and the same. Collected in the omnibus editions Miles Errant and Borders of Infinity. On the run from Cetagandans furious about his Dagoola IV escapade, Miles and his fleet reach the relative safety of Earth. When he reports to the Barrayaran Embassy there, he is made the Third Military Attaché. Miles is captured, and his clone, trained as an assassin by Komarrans bent on exacting a measure of revenge for the conquest and annexation of their planet, is successfully substituted for him. Collected in the omnibus edition Miles Errant. The novellas "Mountains of Mourning", "Labyrinth", and "The Borders of Infinity" were reprinted with an untitled framing story in which Miles reports to Simon Illyan, head of ImpSec. The framing story emphasizes an audit—both financial and political—of ImpSec, questioning Miles' activities and expenditures during the previous adventures. This volume is short-novel length. The novellas are currently in print as part of other omnibus volumes but without the tie-together framing story. Pretending to be Miles, Mark takes part of the Dendarii on a mission to free clones from Jackson's Whole, but is soon surrounded by the enemy. When Miles comes to the rescue, things go very badly wrong. Collected in the omnibus edition Miles Errant. After Miles is forced to resign from ImpSec for covering up his new medical disability, he finds himself temporarily appointed an Imperial Auditor, with sweeping powers and answerable only to the Emperor, to investigate the sudden mental impairment of ImpSec chief Simon Illyan. Miles Vorkosigan accompanies fellow Imperial Auditor Professor Vorthys to Komarr to investigate a serious accident in space which may have been sabotage. There, he manages to defeat plotters who seek to seal off the only wormhole to Barrayar, and falls in love with his hostess, Ekaterin Vorsoisson, who is trapped in an unhappy marriage. This novel is notable for the switching of viewpoints between its two protagonists as part of the structure of a given scene. For instance, the scene of Ekaterin's questioning with fast-penta begins from her viewpoint, but as the drug takes hold (and the novel begins a new chapter), it switches to Miles' viewpoint. This technique is expanded in the next novel where multiple viewpoints are used. Collected in the omnibus edition Miles in Love. As Barrayar prepares for Emperor Gregor Vorbarra's wedding to a Komarran heiress, Miles attempts to court Ekaterin Vorsoisson without her knowledge. Part of the omnibus edition Miles in Love. This novella was published in February 2004 as part of the anthology Irresistible Forces (Catherine Asaro, editor). Bujold wrote this after completing Diplomatic Immunity. The wedding of Miles and Ekaterin is recounted from the viewpoint of Miles' Armsman Roic. Miles introduces Roic to Taura on her first (and due to her short life expectancy, probably her last) visit to Barrayar. The pair get along well, despite her rather unusual appearance. However, their blossoming romantic relationship is shattered when he makes a careless remark about "hideous, bioengineered mutants" —referring to the 'butter bugs' in Mark's latest commercial venture. Taura is hurt and insulted. When Ekaterin is taken ill, Taura traces the cause to a string of pearls that had apparently been sent by current Dendarii Admiral (and Miles's ex-lover) Elli Quinn, and which do not look right to her augmented vision. With Roic's help, she brings it to the attention of ImpSec. The poisoned pearls are traced to a newly acquired enemy of Miles's. Ekaterin recovers, and the wedding goes smoothly. That night, Roic is on guard when Taura joins him. She tells him that she probably only has a year or two left to live, and therefore takes everything as it comes. Roic replies, "Can you teach me to do that?" Collected in the omnibus edition Miles in Love. On the way back from his belated honeymoon, Miles is dispatched to Quaddiespace to untangle a diplomatic incident. Collected in the omnibus edition Miles, Mutants and Microbes. On Komarr, Ivan is asked by an ImpSec friend to protect a pretty young woman targeted by a criminal gang, and stumbles into a conspiracy involving Jackson's Whole politics, hired assassins, criminal syndicates, and an old and potentially dangerous secret on Barrayar. And embarrassing in-laws. Still new to her duties as Lady Vorkosigan, Ekaterin is working together with an expatriate scientist on a radical scheme to recover the lands of the Vashnoi exclusion zone, the lingering radioactive legacy of the Cetagandan invasion of the planet Barrayar. When the scientist’s experimental bioengineered creatures go missing, the pair discover that the zone still contains deadly old secrets. Miles investigates a cryogenic corporation on the planet Kibou-daini, with the assistance of Jin, a local boy. Three years after the death of Aral Vorkosigan, Admiral Jole of the Sergyar Fleet (who once was Aral's subordinate as well as lover) receives a proposal. Aral's widow Cordelia plans to use the genetic material she and Aral had saved and offers him the option of fathering children from his genes and some of Aral's frozen gametes. With the publication of Cryoburn, almost all Vorkosigan tales are available as free e-texts on a CD that accompanied the hardcover release. This CD was initially shared online, but has since been withdrawn by request of the author. Vorkosigan's Game (September 1990), an omnibus volume consisting of The Vor Game and "Borders of Infinity"
The earlier novels (except Memory) and the short stories (except Dreamweaver's Dilemma) have been repackaged in omnibus editions. ^ Based on the timeline and map in the Appendices of The Vorkosigan Companion. ^ See Bujold, Lois McMaster (2007). "Space Opera, Miles and Me". ^ The two scenes are both comic: a diplomatic dinner where nobody speaks because there are no translation earbugs in Brothers in Arms (ch. 4), and a scene where similar translation devices provide very bad translations in Diplomatic Immunity (ch. 7). Bujold discusses questions of language and race in her first essay in The Vorkosigan Companion, pointing out that her universe does in fact have a full complement of Earth-descended skin colors and languages. ^ See the beginning of her first essay in The Vorkosigan Companion. Later in the essay she points out that the setting is appropriate for a Regency romance in the style of Georgette Heyer, and in fact A Civil Campaign was compared by reviewer Anne McCaffrey to Heyer's work; see the blurb under "Book Description" at this Amazon page. ^ "Bibliography: Falling Free". Internet Speculative Fiction Database. Retrieved February 11, 2011. ^ "Falling Free". Worlds Without End. Retrieved February 11, 2011. ^ "Bibliography: The Mountains of Mourning". Internet Speculative Fiction Database. Retrieved February 11, 2011. ^ "The Locus Index to SF Awards: 1991 Nebula Awards". Locus. Archived from the original on 2011-06-05. Retrieved 2011-12-06. ^ "Brains Over Brawn Wins Hugo Award". Sarasota Herald-Tribune. September 3, 1991. p. 2A. Retrieved March 29, 2010. ^ a b "1991 Award Winners & Nominees". Worlds Without End. Retrieved 2009-07-11. ^ "1992 Award Winners & Nominees". Worlds Without End. Retrieved 2009-07-11. ^ "1995 Award Winners & Nominees". Worlds Without End. Retrieved 2009-07-11. ^ a b "1997 Award Winners & Nominees". Worlds Without End. Retrieved 2009-07-11. ^ "2000 Award Winners & Nominees". Worlds Without End. Retrieved 2009-07-11. ^ "2002 Award Winners & Nominees". Worlds Without End. Retrieved 2009-07-11. ^ "2005 Hugo Awards". World Science Fiction Society. Archived from the original on 2011-05-07. Retrieved 2010-04-19. ^ "2011 Locus Award Finalists". locusmag.com. 11 May 2011. Retrieved 11 November 2018. ^ "2013 Hugo Award Nominees". www.lonestarcon3.org. Retrieved 11 November 2018. ^ "2017 Hugo Awards". World Science Fiction Society. Archived from the original on 2017-08-11. Retrieved 2017-08-11. ^ See the New York Times listings for 9/19/99 A Civil Campaign, May 12, 2002 for Diplomatic Immunity, and November 14, 2010 for Cryoburn. ^ Bernardi, Michael. "Bujold Cover Art Archive". www.dendarii.co.uk. Retrieved 11 November 2018. ^ "La Saga Vorkosigan at Soleil". soleilprod.com. Retrieved 11 November 2018. ^ Bujold, Lois McMaster. "The Bujold Nexus". Retrieved December 19, 2013. The Vorkosigan series of Novels and Stories – Another listing for The Vorkosigan Saga.